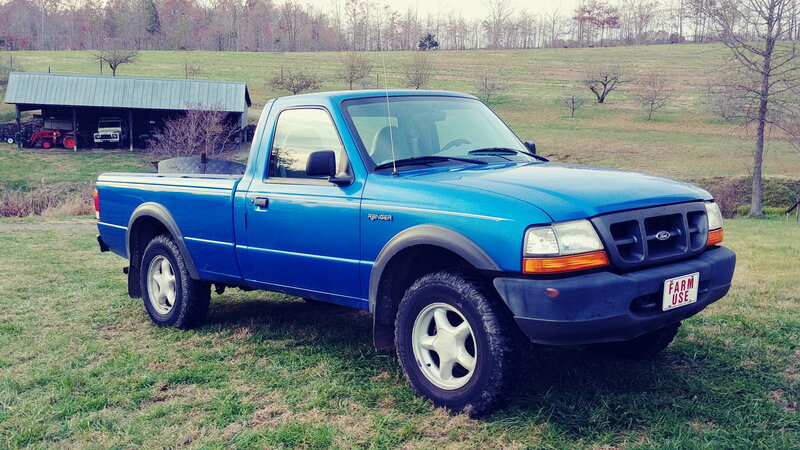 I installed 245/75LT16 MT tires on 95 Mustang GT wheels and fitted these to my new 99 Ranger. The stock wheel was 15x6 12mm. I researched to find out Ford did put 15x7 25mm on some Rangers around 2000. These SN95 wheels are 16x7.5 30mm. There is no interference with these fitted to the 99. Is there any technical issue to justify spacers? I couldnt care less about jutting these out just for a visual appeal. Spacers help prevent roll overs, if you need a rationalization, lol. Well, it appears the 25mm offset shown on some european Rangers may not have been Rangers at all but rebadged something else. There is no definitive information. I'm going to look at scrub angles this weekend to determine if something should be done to approach stock configuration. I'd like to fit 3/4" spacers but there's no reasonable way to do it unless different hubs with that offset exist. I'll probably just leave it alone in the end as it's only a farm truck with limited distance driving to a couple of towns within 30 miles or so. There's a 80 mile radius limitation anyhow. 31x10.50r15LT duratrac Wrangler tires. But stock suspension..